The canal adopts a very quiet rural ambiance with birds singing, sheep baaing and even donkeys braying as it weaves to bridge 102 where a weather beaten sign holds the promise of the Old Olive Bush. The towpath alternates between pretty good and a bit dodgy in places and only a trailer company breaks the verdant monopoly until you see the village of Lower Shuckburgh with its attractive church appearing rather large to serve a population of less than a 100. Particularly after bridge 107 the towpath deteriorates markedly and then the canal turns sharply under bridge 108 where you’ll see the Kings Head is only five minutes away from the next bridge. In fact you’ll notice subsequently that the pub has mounted an impressive outdoor advertising campaign along this stretch of canal. After running adjacent to the A425 the canal breaks away and straightens to Napton Junction (Wigrams Turn). Here is the modern and well placed Wigrams Turn Marina catering for over 200 boats. And this is where we leave the Oxford to join the 14½ mile long Warwick and Napton Canal . Follow the sign post to Warwick past private moorings and you’ll notice the Napton Reservoirs that were built to solve water shortage problems but were superseded by a back pumping system. Calcutt Top Lock is the start of the long drop westward to Warwick and the 1930s wide locks are side by side with the original narrow locks. There are three locks and adjacent marinas offer no shortage of places to moor your boat if you weren’t walking. A group of working boats gather around what looks like an old wharf at bridge 18 but there is little of interest until the Boat Inn at Birdingbury Wharf, Stockton, a village once and possibly still famous for Blue Lias clay and cement. At Stockton Top Marina we see Kate Boats and their ubiquitous hire fleet before moving onto the eight Stockton locks, where you are rewarded with the attractively manicured gardens of the Blue Lias Inn next to the Bottom Lock. The Warwickshire Fly Boat Co. is located next to the cement factory destined Kaye’s Arm and the easy towpath continues to descend to a choice of two pubs, The Two Boats and The Cuttle Inn. Be warned, these are the last canalside inns until Leamington. The canal straightens as you go over the River Itchen and then onward through the Warwickshire countryside. Before bridge 27 note the extensive new plantation on the left, after the bridge there are moorings and the canal straightens again. Peace prevails as you approach bridge 28 and the top two staircase locks at Bascote. Nothing much disturbs the rural idyll as stables are passed to reach the very neat Welsh Road Lock 18. At bridge 31 you realise that you are walking part of the Warwickshire Centenary Way and the Blue Lias Ring. The towpath improves up to Wood Lock 19 and once past the Fosse Long Term Moorings you hear the first loud traffic noise for ages at Fosse Wharf. The woods near bridge 33 have a smattering of bluebells in the spring although the sound of gunfire might deter any closer inspection. A detour here to Offchurch might be worthwhile. After bridge 34 you might find hand crafted garden furniture for sale near a DIY memorial dedicated to a boater who died too young. The canal cuts around the hillside with the Leam below. The path widens, passing a winding hole and then across a steel grill with water cascading into the river. There’s now a row of moored boats and as you pass rubbish dumped at the busy bridge 35 and then an industrial estate, the smart money is on Leamington not being too far distant. The canal becomes increasingly unkempt, houses appear and dog faeces need to be avoided before getting to The Fusilier at bridge 37. There are pleasant terraces on the right but when the trees on the other side disappear you realize that the newly visible factories are not going to win any architectural prizes. 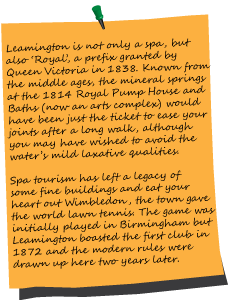 Leamington is the first large urban area the Grand Union passes through since Milton Keynes. They are very different. Whereas Milton Keynes is all about new clean industries logically laid out on business parks, Leamington’s industry is on the greasy side, a sausage sandwich with fried onions compared to MK’s Sweet Chilli Prawn Salad Wrap. The town spread south following the construction of the Warwick and Napton which now glides through the town hidden away by trees from its drab surroundings. The Tiller Pin and Moorings pubs are passed followed by residential canalside developments not exactly enhanced by a Lidl supermarket. Two aqueducts take you over firstly a railway line, then the Avon and onto Warwick with yet another Tesco enriching the journey. 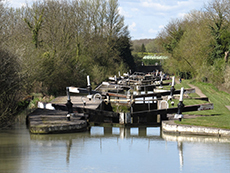 Supported by government grants to modernise the waterway, the narrow locks (and several bridges) between Napton and Camp Hill Top Lock in Birmingham were rebuilt to take widebeam boats or barges up to 12 feet 6 inches in beam, or two narrowboats. The canal was dredged and bank improvements carried out. The depth was increased to 5 feet 6 inches to allow heavier cargoes and the minimum width increased to 26 feet so that two boats of 12 feet 6 inches could pass. Lock works were completed in 1934 when the Duke of Kent opened the new broad locks at Hatton and other improvements finished by 1937. Warwick was founded as a defence against the Danish on a small hill which controlled the river valley and the roads to London, Stratford, Coventry and salt town of Droitwich where the natural brine is the most concentrated this side of the Dead Sea. Two marinas operated by Calcutt Boats opened in 1988 and 2006 for 240 boats offering ‘peaceful moorings at the heart of the country’ and then further on there is Ventnor Farm Marina. Completed in December 1799 at a cost of £75,000. Using the Greenway, a disused railway line that departs from Radford Bottom Lock 23. Offchurch is a pretty village once owned by Leofric whose wife is more widely known, she was Lady Godiva. . Although mostly consigned to industrial history, the cement workings and quarries are still present throughout the area. One company, Nelsons operated its own narrowboat fleet and was served by a branch canal that is still visible. One of the last commercial contracts on the GU was for carrying cement from Stockton to Birmingham.